Remember a few weeks back I blogged about three hong kong films having a North American release this year? I was a bit disappointed about how little there was promoting True Legend‘s release. It seems my internet whining has payed off as we now have a poster and a trailer for this film. Rejoice! 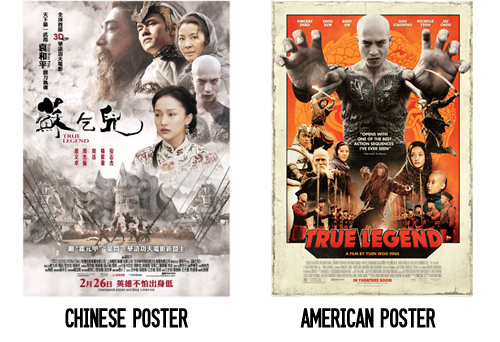 Let’s have a comparison between how China and America handles the poster. The focus on individual characters is different too as my first glance at the bald-headed central figure (Andy On) gave me zombie vibes. Then again, the last time he worked with Yuen-Woo Ping was on Black Mask 2 and had a goofy get up then. The two apparently did not get along on the set so I suppose this is their hatred for each other visualized. Pretty gruesome. We must be long past the days of Crouching Tiger, Hidden Dragon as there’s no predominant mention of Michelle Yeoh’s role (image or large text) wise. Remember ages ago when it was difficult not to find some blurb about her being a Bond girl? Sometimes those quotes were bigger than the film’s title. Times have changed! I guess Michelle being around 48 years old also doesn’t help your case. But i’m still excited about seeing her. On a final poster note, True Legend was shown in China in 3D…sort of anyways as parts of the film were shot in 3D. I’d love to see “Put Your 3D Glasses On Now” printed in Mandarin on the screen but I can’t find any information about it being shown in 3D on the poster or anywhere else online for it’s American release. I’d say it’s safe to assume we are getting it how most film fans would want to see it, in traditional 2D. The trailer can be viewed here. We get one lovely line spoken by the late David Carradine explaining how I suppose we really feels about Chinese people “Break their necks!”. Typical nonsense and kind of awkward but it’s not like this is the only film that has been marketed this way. The trailer is a bit too empty for me as it doesn’t really suggest how it will stand out from other martial art epics we’ve seen. The inclusion of a scene involving a vein growing on some muscular skin looks a bit more video gamey than probably intended. On a positive note, it does include this final goofy clip of Gordon Liu. For our UK friends, it seems that True Legend has already has it’s premiere in September. Has anyone there seen it? Thoughts? This entry was posted on Sunday, April 3rd, 2011 at 8:59 pm and is filed under china, david carradine, film posters, gordon liu, michelle yeoh, true legend, yuen woo-ping. You can follow any responses to this entry through the RSS 2.0 feed. You can leave a response, or trackback from your own site. I’ve not seen it as yet, advance word wasn’t great so I’m holding off for a price drop. That’s what I’ve heard as well sadly. After I made this post, I looked at other blogs who’ve had some pretty nasty things to say about it. Talk about doing research late. Whups. I will approve this mildly spam-post only on the condition that I will get advance tickets to this when it comes to Ottawa. Make it happen DWong!